No question about it, 1965 – 1976, often labeled the black arts era, represents one of the most important moments in the history of African American poetry. Between 1968 and 1975 in particular, more than 60 anthologies featuring black poetry appeared in print. 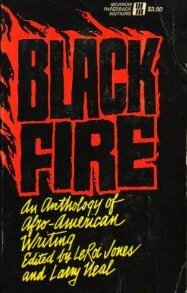 The publication of so many anthologies during a relatively short period of time accentuated the idea that the Black Arts Movement was in fact a movement. Collectively, the anthologies helped display the idea of a united front among a large and diverse range of African American poets. The anthologies also assisted in establishing contemporary poets such as Nikki Giovanni, Sonia Sanchez, and Haki Madhubuti as central figures. At the same time, the collections reprinted previously published poems and thus served to renew interest in elder poets such as Gwendolyn Brooks, Robert Hayden, and Margaret Walker. The anthologies established or solidified tribute and historical poems as well as poems about black music as central types of African American poetry. Because of their influential authority in designating literary value and keeping a select group of poems and poets in print, the anthologies operated as important forces in the formation of a canon of black poetry. Never before and in no years since have so many anthologies featuring African American poetry appeared in print.